Mumbai, October 8: Essel Group, one of India leading business conglomerates has joined hands with the Federation of Indian Chambers of Commerce & Industry (FICCI) to boost the Government’s ambitious ‘Smart Cities’ project. 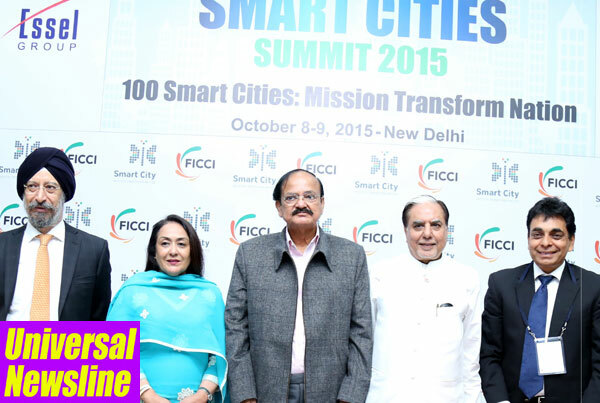 At the Smart City Summit held in the Capital on Monday, Essel Group, a front runner in the Smart Cities Mission, vouched to support and work closely with FICCI to help achieve the Government’s Mission of 100 Smart Cities. Speaking on the side-lines of the summit, Dr. Subhash Chandra, Chairman, Essel Group said that the Group will collaborate with the Government for its Smart City vision “This is a perfect platform to present our commitment in creating world-class cities and transforming quality of life of people in India. We are delighted to be FICCI’s strategic partner in this journey towards delivering integrated, inclusive and sustainable development of cities in India. The association will pave the way for bringing in a wealth of knowledge, talent and domain expertise in the areas of engineering excellence, renewable energy and infrastructure” he said. Also present during the summit were Shri. M. Venkaiah Naidu, Hon’ble Minister of Urban Development, Housing and Urban Poverty Alleviation and Parliamentary Affairs, Government of India, Shri. Ashok Agarwal, CEO, Essel Infraprojects and Dr Jyotsna Suri, President, FICCI. The Group recently signed an MoU with Confederation of Indian Industry (CII) to support the latter’s National Mission on Smart Cities by agreeing to provide necessary inputs to generate ideas for policy advocacy and promotion of smart city concepts amongst stakeholders. It will also support CII’s thought leadership role and knowledge repository by providing reference points along with other Technology and Infrastructure solution partners showcasing best practices in various fields related to the development of smart cities. In addition Essel Group will support CII by conducting feasibility studies for the evaluation of potential target cities with regard to opportunities in energy management, mobility solutions, building management systems and other associated areas. Dr. Subhash Chandra was also a part of Prime Minister Narendra Modi’s delegation to Germany where the Group participated in one of the world’s largest trade fairs, Hannover Messe 2015 and showcased the Smart City Model / Governance framework. During the event, the Group forged alliances with five leading German firms to develop green energy projects and smart cities in India. Essel Group plans to invest over $2 billion in the next three years in transforming major cities across the country. Essel Group is the only integrated smart city developer in India with proven expertise in creating single a window utility corridor. Smart City Summit is a FICCI initiative to support the gigantic business interests generated of the “100 Smart Cities” initiative of the Government of India where FICCI aims to provide a platform to integrate the country’s leadership along with the industry experts to reach an actionable and conducive approach towards an overall inclusive development of the Urban India and create roadmaps for smarter future. The Summit will discuss the progress of India’s Smart City mission, approach and plans adopted by States, Cities and Urban Local Bodies, implementation challenges, business opportunities for smart technology solutions, case studies of international smart city projects and experiences and expert views of Indian and foreign urban sector professionals towards building smart cities.